Goddess’ Rage is surprisingly difficult for a 9-box-mission. The reward is about the same as Spy Hunt but I would prefer Spy Hunt any day over Goddess’ Rage when I want to solo a TBS mission. 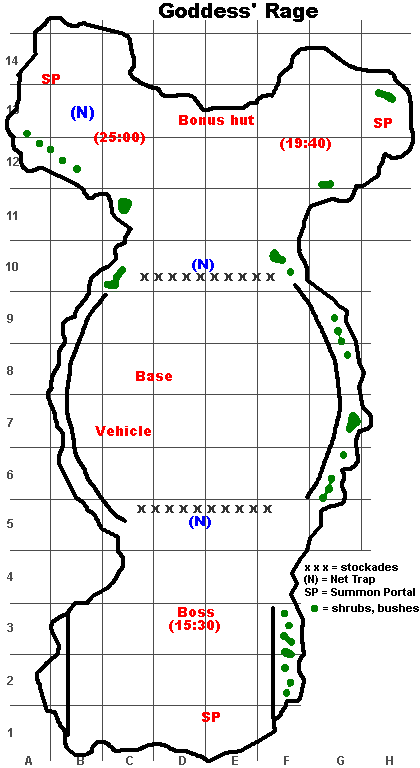 That said I must also admit that the map in this blog entry contains only a few of the traps. The simple reason is that when soloing you can’t leave your base area – and I know from earlier times, when I duoed and trioed this, that there are traps out there. So help is – as always – appreciated. Goddess’ Rage is a classic wagenburg mission (Wagenburg: German for a circle of wagons around your campfire where you huddle in fear while aborigines ride howling around your improvised wall shooting arrows in your most sensible body parts). You defend. They attack. 1. From start: 1st wave – you see them already. 1. 25 minutes left: 2nd wave, coming from the northwest (left). 2. 19:40 minutes left: 3rd wave (called “final wave” in the mission), coming from the northeast (right). 3. 15:30 minutes left: 4th wave, coming from the south (bottom) with the final boss in it. The times are not quite exact. You will need to lay traps in this mission. Net traps II are fine. Take 20 or so with you (you won’t probably need all but better safe than sorry). And there is a troy side mission to get at Odysseus’, which resets weekly. You have to split your troups. 1. Your cannon main goes to the south, carrying the first seth’s will from your oracle with him. You slay the four monsters already there. Then your task is to remove the trap there. After the second wave appears, lay traps to block the onslaught of the boss wave. 2. Your sheriff and your oracle go north. You should try to kill every wave before the next wave occurs. That means: hurry up! After the wave is defeated, though, stall until the next wave appears. This way you avoid too many summon portal monsters. Lay traps to block the gaps in your stockade row to hamper the waves from the north. 3. After the second wave is defeated, hurry down (to the South) and reunite. You want all your mercenaries ready, sethed and in good health, when the Giant Demon, the final boss, appears. Debuff the boss with your cannon main and then shoot him with your sheriff. Don’t try to kill all surrounding mobs. The main danger here is to be overwhelmed by masses and masses of monsters who are individually weak but together quite nasty. But you have laid traps already to block their path so chances are that you can kill the boss quite easily. One group goes north (trio: two players) and do the job described above for sheriff and oracle. The other player goes south, kills the four mobs there and if he is strong enough he can try to go further south. Don’t forget that there are traps which are currently not noted on the map in this entry (and they are net traps). You will encounter a small group of mobs already standing there and if you go further you can even take out the summon portal. As soon as the second wave appears, head back and lay traps to protect your base area from the attack of the boss and his minions. The North players should eliminate the second wave as fast as possible and then hurry back to the South player. Goal is that they are there before the boss comes up and eliminates the poor Southy. The South player should fall back as far as possible so that a line of traps (or better two lines) are between him and the boss and his minions. This article says there’s 2 bonus tents that give 3 water of life each. Yeah, I found one of these huts yesterday at the border of D13/E13. Still looking for the second. I wonder whether it is more sensible to use StaffM+Ora+Jani (sethed, obviously) or StaffM+Ora+Witch (sethed Cata then) or StaffM+Ora+Tank (like Lady Knight). Everytime I try to solo this mission I fail because mob waves overwhelm me. Net traps tend to leave out ranged mobs and those are the worst. what kind of a weapon does sheriff need in order to one shot monsters on this map? @Eronaile: Staff Main is in this mission sadly a bit in the disadvantage. You have to split your forces. With my setup it is easy: Cannon Main takes boss side (seth it at start, kill all start mobs, then wait), sheriff and oracle the other side. When your staff main and your witch each for themselves cannot kill the mobs accompanying the boss, I think you can’t do the mission. Both are not exactly hit point monsters and die too fast. But I admit: I have no clue how a staff main does TBS missions. There are guides from johnfarson in the AO forum which are said to be very good. @Kuba: dg+5 was enough for me (if sheriff is sethed). I managed to solo this mission at lv118 with staff main+witch+oracle. The main problem is the boss’ wave, other than that its quite easy. Sadly, the boss requires me to use referral buffs (+50atk and +25def), and throughout the mission i use about 10-15 traps (probably ~10 traps I and ~5 traps III would do). You also must be very fast, othervise you will be overwhelmed by the minions and fail. 1. Upon starting the mission i make a Cata, seth it and make it go B/C6 and kick the monsters there, while both staffs go to north to kick the mobs at D11 (beware of the trap behind the barricades, so try not to go there at all). 2. Cata goes to staffs at north. Put a pair of traps around D/E 9-10 ( I would be sufficient) and wait for the next wave, kick it when it comes. 3. Check south, some minions should be incoming there, send sethed cata to deal with them while staffs heal and put another pair of I traps at the same place. -if you still have over 19mins place another trap at north and skip turns as fast as you can, so another wave would come – kick it and place another pair of traps III at E 8/9. -If you have less than 19mins, place more traps at E8/9 (3 best) and rush down to wait for boss, try not to skip turns unless traps are being planted. 5. at ~18:30 you should have at least 3 traps III planted at E6-7. dont skip turns and wait till the boss pop up comes. then seth the cata and skip turns for it to come. Once it comes, try to lure the mobs into your traps and attack the boss with both all you got. Should go down in 2 turns. The problem begins when you kick the 3rd wave at the top, if you weren’t fast enough the boss will spawn and the mobs from top will come at the same time, and you wont be able to deal with them and either you will die or your base will get destroyed, but if you were fast enough you can kill the mobs at the top and only then the boss spawns. Thanks for the report. Sounds somewhat horrible to do, though :) Fast moving is not my specialty. Yeah, horrible, but doable and the rewards are awesome at 115. It also is quite short and there is only 1 trap you should be aware of. Other than that, you just have to invest into traps and some referrals. Heres a video that i made earlier today. enjoy. As a staff main, I never had to use traps or buffs(not including blessing license) to solo this in squad mode. It’s really a very easy mission once you get used to it. Currently I use ora + druid, but in the past I used ora + lk. My gears are pretty good at the moment, but in the days when I used my lk they were only mediocre. If you don’t have a BL, just do the Momotaro quest every now and then. You’ll get a mini blessing pot. Leave them disabled except when you do TBS. If your FB is maxed, it should be killing everything in this mission in 1 hit except the boss and maybe the spear guys. Just FB each wave and slap any mobs which look like they didn’t take enough damage to die at the end of the turn. Mobs from the SP’s are too few to cause any trouble. If they show up between waves, it gives you something to do other than twiddle your thumbs. If they show up with a wave, they taste your FB. The boss wave is super easy because they’re all clumped together, just the way a staffM likes it. You might not be able to get all the mobs in one shot, but most of them should be taken care of. And the boss himself has rather low HP. The only reason I can see using a trap is if you’re nervous that you might not have the boss dead by the time mobs from the north SP’s are coming in from behind. But even without a druid for BS, a seth’d cata should be doing plenty of damage to him. Also you can use your tank to hold him in place after using FB. Fire damage does about 15% max HP from my observations. If the fire burns out, use a phoenix scroll. I’m pretty sure they make fire too. As you can see from the video, even with all those buffs I didnt one hit any minions (well, ok i did 1hit cannons) with my FB, which was +lv60+charms+necklace. Not sure what you count as “mediocre” and which level you were, but with +3nix weps and the rest being+2, which is considered good for lv115 non-donator I can’t solo this mission without any buffs. Just making sure, you do realize FB does damage twice. Right? Half when you cast it, half at the end of the turn. It looked like it did at least 50% on the bow guys in the beginning. But since you casted meteor on top of it to finish them off, I couldn’t see what would have happened at the end of the turn. And that was before you had full upgrades. Are you using Night Savior charms or just Savior II? And I can assume you’re under blessing? I’ll admit it is a while ago that I’m thinking of. It could have been before they increased the mdef of mobs in tbs. But before they did that I’m pretty sure FB 1-hit just about everything in any tbs, including the spear guys in this one. It looks like the gun guys wouldn’t die from FB alone in addition to the spear guys, which isn’t how I remember it. Very strange. By the way, by “mediocre” I meant still using freezing and divine. But that stuff doesn’t affect FB damage anyway. Honestly, I think it’s down to preference. But if you’re speaking from a +10 equip point of view, then yeah cannonM would be better because deva shell is gonna allow you to 1-hit bosses. But in that case, swordM is just as good with shield bash. It may only hit one target, but if you’re using super equips then you only need it to hit one(bosses). Normal mobs don’t need to be debuffed. Even axeM can have bs now, which makes them more than decent in tbs. I know several non-cannonM/non-staffM people who can solo even the hardest missions just because they got great equips. What your main is doesn’t really make a huge difference in that case. But at low mights, I would say any main can be good if the right mercs are brought along and the right strategy is used. Although I will say staffM and cannonM are the easier ones to play. And some missions do favor one main more than others. For example, Spy Hunt is generally easier for cannonM, while Alishan in Ruins is generally easier for staffM. A friend of mine surprised me the other day by soloing ali120 with bowM(120 without upgrade, and ~1m might total), shaman, nvik, and valk. I can’t even imagine how she did that from my point of view as a staffM. My advice to people is just work out a strategy that suits you. Don’t feel you need to change mains just to solo tbs. Correction, I meant The Shaman Returns, not Alishan in Ruins. Currently i used my maniac to do hunt and soloing TBS. My Main is a Lv 123 Maniac, bringing A Lv 121 LK, and a Lv 110 Witch. I rarely bringing my ora in TBS, but in skirmishes, i use 2 healer. I have decent equipment, a set of +2 DG and +3 Nix, decent weapons, that is including, a +4 DG Power Saw, a +2 DG sword and Shield, and +5 Nix Staff. Is there any guides in using Power Saw Main in TBS? Especially Higher level TBS (120 & up). sir, i really want my sheriff can one to one shoot monster in tbs 120 and up all mission without seth. her (lv 136) equip are evil gun +10, armor+4, tough ruby neck+3, 2x dex ring+4 lv 120 (no ring 130 in my server yet), 2x earing+4 lv 120. rest evil +2. under royal feast+tittle and she is full upgrade and skill still cant do one shoot. i’m really her can do it so i can replace oracle with melle merc. any clue sir? I have a sheriff with a pega+10 gun, a +10 evil helmet, +7 evil gauntlet and other nice equipment. She can’t one-shoot monsters without seth all the time (often, but not always). May be now in Godess’ Rage but not in Last Battle, for example. She needs two hits to do that, which is guaranteed with seth’s will (at least I never saw her failing to one-shot-kill normal monsters there). Without seth’s will it happens often but not always that she gets two hits in one turn. Yeah, that is a good strategy, though I am not sure about only 1 to 2 traps. But where is the difference to the strategy outlined above? In your strategy (as I have seen from your video) you meet boss at the base and 1-shot kill him. But for low lvls this strategy is not good because from the opposite direction there is a rush of mobs too so if you don’t kill boss fast your base will be destroyed. If you meet the boss at his spwan spot you will have usually 3-4 more turns and furthermore opportunuty to get rid of his all minions at once. Ah, ok, I understand now. That is certainly a wise precaution. Thanks, that is very helpful for the non-cannon-users.